In 1927, a newfound volunteer commitment financially stabilized the Torrington Council. With cash on hand, the Executive Board could hire a full-time Council Executive; however, because Herbert McLeod found his other part-time work more stable, he resigned to make way for Edward Jacot. Jacot, a veteran of the First World War, served as Scoutmaster of Troop 1 for seven years, and for the recent camp season was the assistant director and aquatics instructor. Chief Jacot set to work immediately, starting with a promotional drive centered on a public scoutcraft exhibit at the council offices. Scouts showed off the various projects they made as part of merit badge work. At the end of the weeklong exhibit, the projects were moved to shop windows around Torrington to keep Scouting in the public eye. The highlight of the drive was a series of acts at the high school’s adult education Thanksgiving show. One patrol from Troop 4 showed how to construct a signal tower, a Scout from Troop 2 demonstrated fire by friction, and other boys offered a series of Scout songs. The event sought to introduce Torrington’s immigrant population, who were the primary students at the night classes, to the Scouting movement. After the publicity campaign, the council launched a membership drive; each Scout who recruited two new boys or persuaded three who had dropped registration to return received a copy of the new 1927 Scout Handbook. Chief Jacot also launched the national council’s new five-year training program with a course on scoutmastership. As a vote of confidence in the reorganized council, Jennie Coe formally presented the deed to Camp Workcoeman to the council; because the council was not incorporated, Scouters Frederick Baldwin, Alfred Burg, John Calder, Frank Damon, and George Vogel formed a committee of trustees to hold the property. By the time the 1928 camp season rolled around, there were enough reservations to open Workcoeman for six weeks, and there was a good chance of beating the attendance record set in 1924, 76 Scout-weeks. 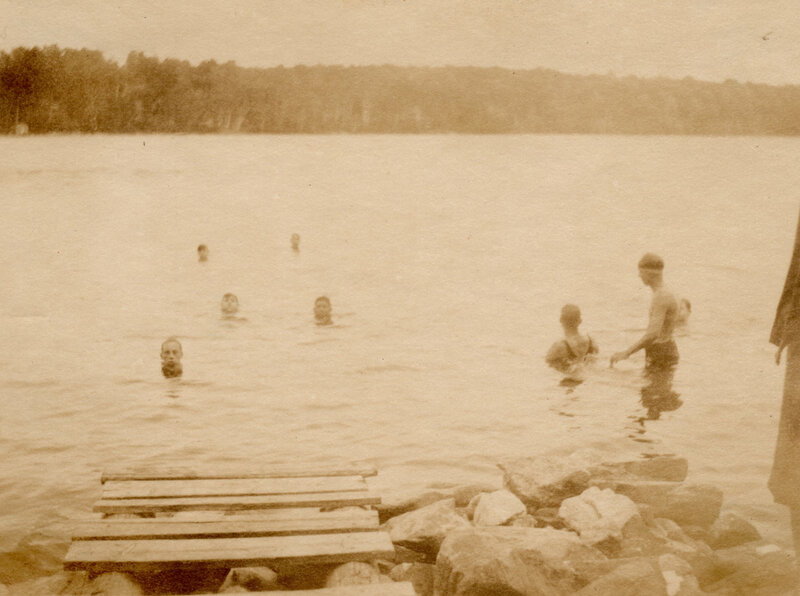 The image below show Scouts swimming at Workcoeman sometime during the late 1920s.